Over the last couple of weeks I have been in the very cold and snowy East Coast US without my bike (just for reference my bike is called “Jebediah”, or “Jeb” – as named by my girlfriend), so I have been jogging. I’ve been running to keep fit and keep the weight gains down while I stuff my face with all my favourite american munch. I did a few short runs (up to 30 mins) over the few weeks prior to my departure just to prepare and condition my body, and I am now running up to an hour without too much stress. Running in the sub zero snowy conditions (in Massachusetts and New York) is pretty tough on the lungs and the joints but once I get warmed up it’s OK.
During the run I keep my heart rate hovering around 160-170bpm for the longer runs and 170+ bpm for the short 30 minute jogs. I got completely lost the other day and completed one long 1.5 hour run, I found a good rhythm by the end but I felt it in the legs the next day. The data for that run is shown below (click to enlarge). I have compared my pace to a friend of mine to is an avid and fast runner and I’m around 1-2 minutes per mile slower than him, I’m pretty slow. I will attempt to run a 5 k in under 25 mins by the end of this trip. Before I came out here I was wondering how effective running is for cyclists and whether it might even have a negative impact on my cycling. I will just summarise some of the information I found on this subject whilst searching around. Aerobic workout: Running is an easy way to have a good aerobic workout in an hour. Convenience: Going for a jog is very convenient if you’re away from home without your bike, short on time, hate the turbo, or don’t want to get out onto the dark and wet winter roads. Injury: Running is a high impact pursuit especially when compared to cycling. Runners often get injuries, and a cyclist with a completely unprepared system will shock the body and cause it a lot of stress. Warm-ups, cool-downs and stretches are very important for reducing the risk of injury, even more so in the cold winter months. For me, the biggest risk recently has been slipping and rolling my ankles on the ice. Muscle groups: Running uses different muscles to cycling. Therefore although gains in running will build the aerobic system they will not be completely transferable to cycling. Weight gain: Running will engage muscles that are not utilised for cycling resulting in muscle gains and the impact may increase bone density. The combination of these factors may result weight gain without additional benefits to your riding. I’m imagining this is negligible and is not a concern for someone like me. Regardless of the negatives if you are away from home without your bike running it is a great way to train, maintain fitness and keep lean. Depending on the amount of training going, a 30 minute jog could even provide a good addition to your cycling weekly routine and improve aerobic fitness and your cycling. At the moment I am trying to get as much training done, and mileage achieved before I go away for new years (woop woop). I have got in a few good rides on the road, but with temperatures barely getting above zero its pretty difficult to muster the enthusiasm to get out on the road. As a result, most of my rides have been on the indoor trainer. Through a combination of TV, music and data displays I actually find the indoor trainer quite entertaining (wireless data transmission instructions). There are a few specific sectors that I am targeting with different ride types. Each one being more fun/painful to train, as the interval times reduce. By riding at lower heart rates (< 140 bpm) and less effort over longer durations I hope to improve my riding efficiency and endurance. This should ultimately get me to the finish line of road races fresher and with more energy for moments requiring maximum effort and energy such as a final sprint. One ride I really like doing is in the Surrey hills over Leith Hill and Box Hill (route), which I did the other week. The cold was a bit of a shock after returning from Australia and lost all feeling in my hands and toes after about an hour… but it was a good ride nonetheless. The last week has been busy with my move from London to Birmingham, but I have managed some good 2+ hour rides on the turbo trainer and hope to get out in the Clent Hills over the weekend. The peleton riding up Box Hill in the 2012 Olympic road race (source, daily mail). The lactate threshold is essentially the point when your body is producing and processing blood lactate in equal measures. This is the power that a rider can sustain for a 1 hour period, therefore having a high lactate threshold is very important for shorter fast races lasting around 1 hour in duration. Threshold efforts, for most people occur at 170-180 bpm but is different for everyone. Riding at threshold is my favourite workout, I do this by riding intervals of 15-20 mins, three or two times respectively, with recovery at lower effort (120-130 bpm) in between. An example of my heart rate based interval training is shown below. Over the next couple of months I will be focusing on lactate threshold and endurance rides. But I will throw is the odd shorter interval based ride to keep my fitness and race pace up for any winter events. This can be trained by riding at efforts beyond the lactate threshold, in terms of heart rate this will be high 170s bpm finishing on maximum! The VO2 max is trained by riding 2/3 minute intervals of maximum effort. During races this will be for opening/closing a gap, the last lap of a criterium etc. Anaerobic riding takes place during shorter hard efforts. Having a high anaerobic power output is need for the deciding moments in racing: initiating a breakaway, sprinting, or just holding on when it lines out in the final km of a race and your chewing the tape off the bars. A riders anaerobic ability can be improved by training intervals, short efforts of 30 seconds to 2 minutes. These efforts should reach maximum heart rates and HURT! There are two leading HIT training methods. Tabata method: A study by Tabata et al. (1996) showed 8 cycles of 20 sec at 170% Vo2 MAX with 10 seconds rest/low intensity recovery intervals. Little Method: Little et al. (2009) demonstrated the improvement achieved with 12 cycles of 60 seconds of at 95% VO2 MAX followed by 75 seconds of low intensity intervals. An example of one of my rides that focuses on short intervals is shown below. As the season draws closer I will incorporate more short interval training rides into my riding to improve on power and speed. Thanks for reading! Tabata I., et. al. 1996. Effects of moderate-intensity endurance and high-intensity intermittent training on anaerobic capacity and VO2max. Med Sci Sports Exerc, 28 (10), 1327–30. Little, J. P., et al. 2009. A practical model of low-volume high-intensity interval training induces mitochondrial biogenesis in human skeletal muscle: potential mechanisms. Journal of Physiology, 588 (6), 1011–22. This article outlines how to get real-time data displays and recording of speed/cadence and heart rate on your PC. Assuming you already own an ANT+ compatible bike computer e.g. Garmin 500 as many riders do, this is easy to do and will only cost about 18 GBP (25AUD) with the purchase of an ANT+ USB stick. Previously only riding on spin bikes in the gym every so often (and quite enjoying it) I did/do not understand why everyone has such a hatred for their turbo trainer. Regardless of this, and guessing they can’t all be wrong I decided to introduce some gadgetary into my indoor cycling experience to keep any potential hatred at bay for as long as I can. The first step to my boredom repelling plan is to have my monitor data transferred wirelessly to my PC and then displayed in real-time. Firstly, ANT+ components and an ANT+ USB stick are required (Garmin and other versions are available e.g. the slim lined Suunto USB stick – cheaper on amazon). I planned on doing this with Golden Cheetah v2.1 as I had basic previous experience with this software. For anyone that hasn’t used Golden Cheetah, it is a FREE cycling performance software (for details and download see website) that allows you to import all cycling performance data for viewing and detailed analysis. I attempted using v2.1 for wireless data recording and display but I found the process of installing Quarqd (a daemon for communicating with ANT devices and recording ANT+ data) and ‘VirtualBox’ quite long, convoluted and I was eventually unsuccessful. However, the new Golden Cheetah v3 has real-time data recording and display built in as a function. This version is still currently under development but is available to download here, I would use this in addition to the v2.1 for continued data analysis in v2.1 until the full release. Having installed Golden Cheetah (GC) v3 each ANT+ device has to be ‘paired’ with the ANT+ USB stick and therefore recognized by the PC software – this is a quick and straight forward process (steps 1-5). 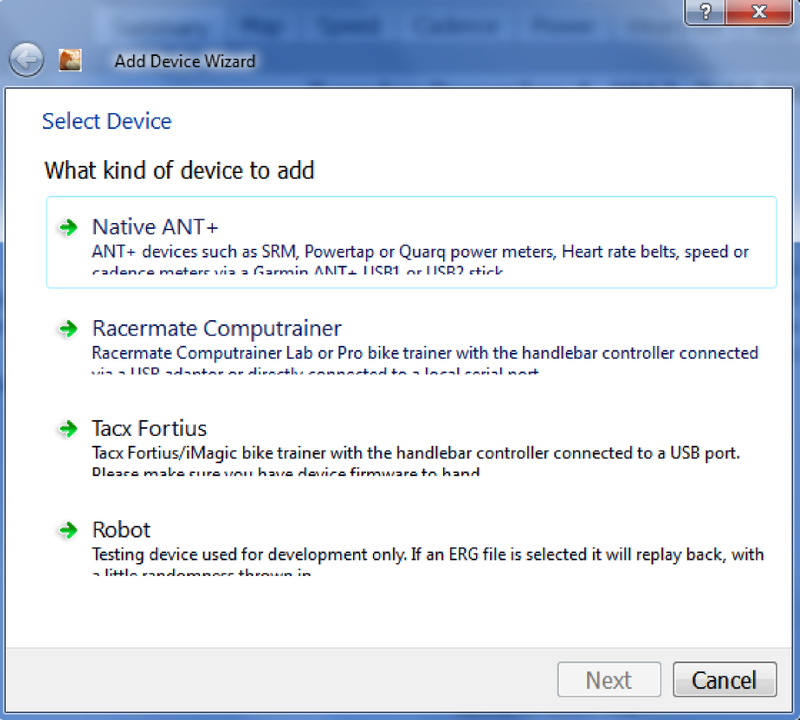 2) Then in the next window select ‘Native ANT+’, it will then search and find any ANT+ devices within range. 3) Select the device you want to ‘pair’ adding each device e.g. Powermeter, Heart rate, Speed/cadence individually. Then select ‘next’. 4) Assign a name to your device, select default profiles for known monitors (seen as the bottom choice) and you are done. 5) To begin, go to the ‘train’ tab (top right) and press the play button (top left). Golden Cheetah will begin to display and record all data. There are two graphical display screens that show the data over 1 hour (left) (then increases in 30 minute increments) which is good for keeping an eye on the overall structure of a ride and the other screen (right) displays 60 seconds for shorter term changes. The monitors that are displayed can be edited, windows moved and window sizes changed to preference. There are also real-time number readouts of each monitor and workout times. Data is then stored as a workout file in Golden Cheetah, which can be copied and placed in your v2.x workout directory for subsequent data analysis if required. Alternatively, a subscription and installation of Trainer Road will provide a real time data display, power estimations, workout plans and analysis for $10 per month. The real-time display and recording of data has enabled me to train efficiently in heart rate zones and maintain a good ride structure. It has been effective in improving my rides whether in the discipline of riding a slow recovery ride of trying to hit max efforts during intervals. When I have got my turbo and speed/cadence sensor set up I will be working on getting real-time estimated power displayed and recorded. I will also be running tests on the accuracy of any power estimations made, based on varying run down times, tyre choice and tyre pressure. Blog article to come….